OurChurch.Com is excited to announce the release of 40 new themes for our WP-EZ Website Builder and a brand new selector that makes it faster and easier than ever to browse, preview and select the best theme for your church, school, ministry or business! Most websites today have the horizontal menu across the top or in a mobile-friendly “hamburger” style menu. However, there are some organizations that prefer a vertical menu on the left side of the page. Previously we didn’t any WP-EZ 2.0 themes with a left side menu, so we developed our latest set of themes – named Sidebar – to include this. 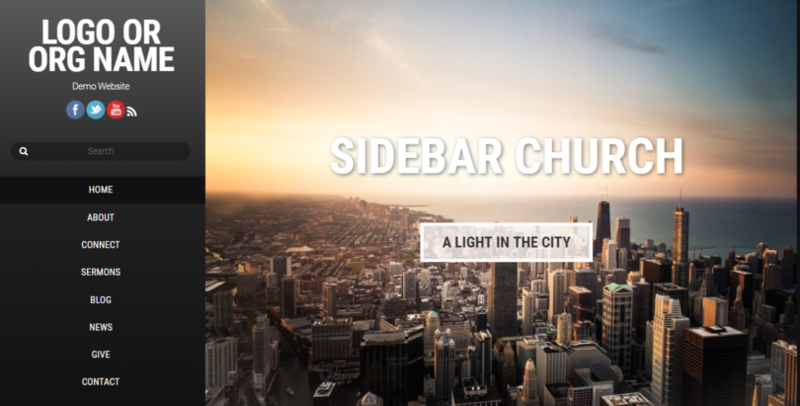 Check out the video tour of the Sidebar Church theme. In addition to the new Sidebar themes, we are excited to introduce new color variations for some of our themes. There are now 4 color options for the Blended, Dragon Drop and Sidebar themes. The colors available include blue, green, red, black, purple and teal. Different color options are available for each theme. If you would like a color that’s not currently available, you can get it with the WP-EZ Theme Customization service. With all these new themes new available (and more to come), we wanted to make it faster and easier to browse, preview and select the right theme for your website. Auto-pagination – as you scroll down the list of available themes, additional themes automatically load. Color variations – when you click to preview a theme, you can also see the other color options available for that theme. Check out the new themes and theme selector here! Then, build a new website with the WP-EZ Website Builder. If you already have a website built with WP-EZ, the themes and theme selector are available by clicking the “Switch theme” option on your WP-EZ Dashboard. What do you think about the new themes and theme selector? Got questions? Post a comment and let us know.